Today, I had a "snow/widespread power outage day", and no power at my house, so I headed out to the South River in Greene County in search of stocked trout (since it was stocked on the 5th). I arrived at the first hole I usually fish, and found 5 anglers elbow to elbow over the cloudy, green colored water. I decided to not mess with that because I prefer not to rub elbows with fishermen towering over a 10x10 yard pool around 5 feet deep. I checked another hole that usually holds trout but saw absolutely none, quite a disappointing discovery. I kept on trucking though. At the next hole, the water was so muddy from a creek feeding in from a cow pasture (muddy from snow melt not cows) that sight-fishing was out of the question. I fished there for 15 minutes along with 3 others that had only caught one, and headed on up the creek, above the muddy deposit, to a pool that occasionally gets stocked. I peered into the somewhat clear but still green water and all I could see were dark blue ang green bars at the bottom of the river, probably 40 of them. I landed a rainbow on my first cast, one on my second cast, keeping them both, and then it got "challenging", 2-3 casts per fish untill I had 4 fish on the stringer, 2 released. At this point the fish were somewhat spooked from all the commotion. I switched from a yellow to a black trout magnet because of the water clarity. I ended up selectively keeping my limit but also balancing the releasing so that they would have a bit of lockjaw and not fall victim to the next powerbait plunker that discovered them. I left the pool with my limit of 6 trout, five released, and a pod of trout that will hopefully last a little longer. Good days are few and far between this time of year, but I try to be out there slaving away enough that I stumble into a good school of fish here and there, and that is what makes it worth all the time and effort. Thanks for reading! 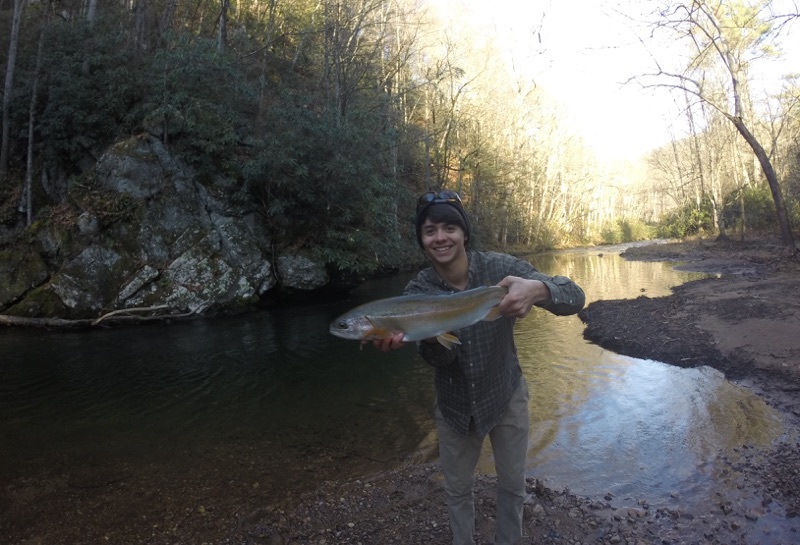 This fish almost looked like a chrome steelhead, silvery sides and a dark green back. I released this one, the red exposed behind his gill plate is because he had very small gill plates, something I notice is common with skinny stockers.